Just like the legend at Rosslyn Chapel of an apprentice mason murdered by a jealous master mason (both were stonemasons not Freemasons) at Seaton we find almost exactly the same story although no pillar is involved. The legend of a clever and impetuous apprentice undertaking work forbidden to him is a common theme. The moral lesson is clear. In the Middle Ages everyone had their place. To progress, if at all, took considerable time and years of proving one’s worth. The apprentice tried to take a short cut by demonstrating his superior skill. Indeed he seems to have more than adequately proved his abilities by carving the Apprentice Pillar in Rosslyn Chapel but he forgot that he was an apprentice and that his boss was a master mason. In the days when it was extremely difficult to quickly raise above one’s station in life those who had attained positions of a little power, like the master mason, only after many years of hard, hard work would defend the status quo come what may even to killing those who transgressed the mores of medieval society. The fact that the legend of the murdered prentice exists in so many parts, and at different times, of the Christian world (not just at Rosslyn Chapel) suggests that it was a ‘lesson’ commonly taught to everyone, with examples such as this. 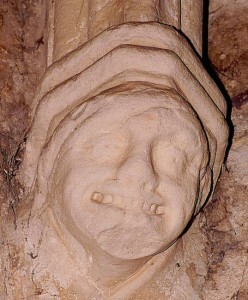 Seton Collegiate Church and this murdered apprentice has no connection with the medieval Order of the Knights Templar. Nor does Seton have any connection with Freemasonry. This carving is in fair condition and the facial expression suggests that it is intended to show the last grimace of death. The wound, from left to right, on the forehead is clear. The confusion between Mason and mason and is due to the lack of a commonly accepted definition of the terms. The Rosslyn Templars are of the opinion that Mason = Freemason (and therefore Masonry = Freemasonry) and that mason = stonemason (and therefore masonry = stonemasonry). Whilst we realise that this need for such definitions nay appear to be pedantic when one knows of the story about a young Freemason who, in all seriousness, explained to a large gathering of Freemasons that ‘we’ had built Rosslyn Chapel it is obvious that there is considerable confusion between Freemasonry and stonemasonry. This is a theme to which we shall return later, hopefully in the form of a paper.